Social dimensions of sustainability are frequently overlooked in academic and public discourse, despite being a key pillar of the concept alongside economic and environmental sustainability. Sustainability is often approached in ecological terms as referring to the access to and use of resources or the ‘greening’ of public policy interventions. Yet social sustainability – broadly construed – refers to other issues that are essential both to place liveability and to citizens’ quality of life. These include – but are by no means limited to – social equity and social justice, social responsibility, social inclusion and exclusion, civic participation and engagement, and the need to manage diversity and difference. Such themes become all the more pertinent when we consider the challenges that emerge when disparate populations share the same urban spaces, raising fundamental concerns regarding the need to integrate all inhabitants in the creation of socially, environmental, and economically vibrant societies. In this context, this article looks at the impact of significant numbers of students inhabiting urban neighbourhoods. As such, we heed the call made by Smith et al.1 that in order to “Deeper understand studentification as a leading process of urban change that is reshaping communities and neighbourhoods”, we need to engage with questions with regards to “Social sustainability, balanced communities, neighbourhood cohesion, social exclusion and segregation”. In particular, this article outlines a pedagogic effort to encourage students to critically reflect on their engagement in the broader city in which they live, study, work and socialise, and ultimately with their wider student community. With 1.75 million people in Higher Education in the academic year of 2015-16 alone, students are a visible presence in many university towns and cities across the UK2. By consequence, many places are experiencing the economic, social, cultural, and environmental impact of student populations on both the areas surrounding universities and in the neighbourhoods where students live. The complex and dynamic processes by which the urban fabric is transformed by student populations and the attendant consequences of this change has been defined as ‘studentification’. The impacts of studentification are manifold and extensive, particularly when students concentrate in specific areas of cities in great numbers. Indeed, in some cases, students can become a defining characteristic of certain urban neighbourhoods, such as Headingly in Leeds3, Sellyoak in Birmingham and Fallowfield in Manchester. One of the key impacts of studentification is on local property markets, with neighbourhoods becoming dominated by ‘houses of multiple occupation’ as local commercial landlords seek to cash in on the rise in student populations4. With such landlords able to charge by the room, families and local residents are often priced out of the market. The resulting demographic imbalance can have further consequences; areas of studentification have seen the closure of local schools and a shift in the retail and leisure landscape to one targeted at student tastes and lifestyles. Furthermore, studentification can have broader environmental impacts with increased levels of refuse, noise and anti-social behaviour. Student areas are also often subjected to higher levels of crime, particularly burglary. In addition to the residential and environmental impacts of studentification, the consequences for the social and cultural fabric of neighbourhoods can be significant. 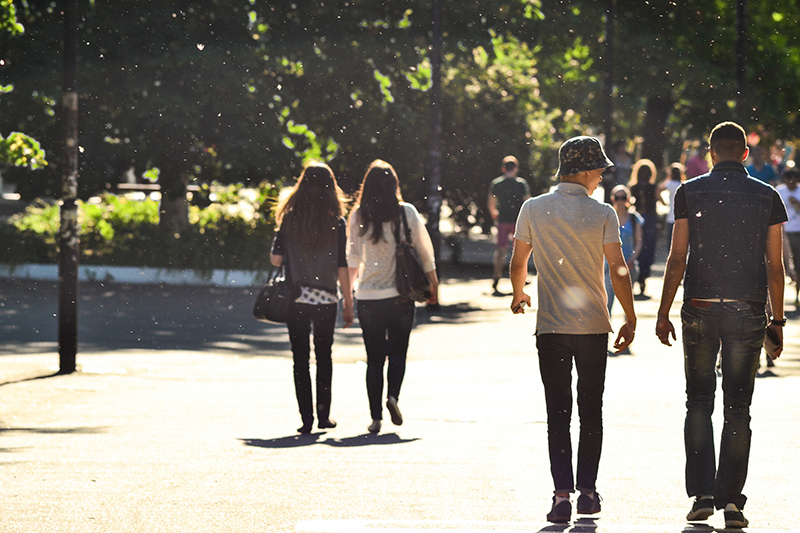 Community cohesion is often inhibited due to students’ residence being mainly during term time, often for just one or possibly two consecutive years. Consequently, students often live lives that are at odds with the wider population, meaning that conflict with residents can emerge as a key issue. Research in Loughborough5 revealed how residents have viewed increasing student numbers in particular areas as both a concern and a threat. Long-term residents of student areas are often displaced or left feeling marginalised or isolated. This raises questions for the social sustainability of areas where both students and long-term residents reside. If, as research has shown, students demonstrate low levels of pride in their environment, and are a source of conflict and concern for longer-term populations, can a sustainable sense of community, place and social cohesion be fostered or maintained? As academics owing our livelihoods to the attraction of students to the city, and with keen professional interests in socio-spatial phenomena through our roles as researchers in the discipline of geography, we were acutely aware of how the presence of so many students has had a marked impact on the social, economic, and cultural fabric of the city. Greater Manchester has almost 100,000 undergraduate students across four universities6, and as with similar cities across the UK, there is concern that relationships between students and ‘host’ communities are fraught. Periodic articles in the city’s press often lament ‘bad’ student behaviour7,8, whilst the University of Manchester and Manchester Metropolitan University have recently temporarily funded private security patrols of public streets in a bid to address concerns regarding anti-social behaviour on the part of students. In an effort to encourage students to reflect upon their impacts on their neighbourhoods and the city more broadly, whilst simultaneously developing and maturing key geographical techniques and analysis, we integrated the study of studentification into an introductory module entitling it “Introducing Human Geographies”. This unit is designed to familiarise students with the breadth of concepts that comprise contemporary human geographies at Higher Education level. This included the development of students’ abilities to understand and critique important academic sources in human geography, and to use and evaluate techniques and approaches to collect human geographical information. After providing an introduction to political, social, economic, cultural and urban geographies, the final six weeks of the course specifically looked at the issue of studentification, a theme that would also provide the focus for the module’s second assessment. The assessment culminated in a 1,000 word essay with a brief to “Describe and discuss the geographies of student identity”. In essence, the module encouraged students to read key literature around the theme of studentification, to design and execute semi-structured interviews and focus groups with their fellow cohort of geography and human geography students, and to develop an empirical qualitative dataset that students could analyse and reflect upon with reference to the published literature. Students were instructed to develop a thematic analysis of their data using the qualitative analytical technique of coding. Beyond the broad remit of geographies of student identity, students were permitted to collaborate to develop any themes that they felt were either important to their lives, or that resonated with them from the academic literature. Since the introduction of this unit, common themes that have emerged across the cohort include the following: the spatial implications of finance and part-time work; places of socialising and alcohol consumption; spaces of consumption and commercialisation; public safety and crime; student expectations and experiences; student community and cohesion; and the identification and discussion of places that students feel they are excluded from or are alienated within. Studies submitted for the module assessment and retrospective discussions with students indicated that the assessment encouraged a significant degree of critical reflection on the part of the students. In particular, the act of consciously thinking about the student experiences of the city, discussing these in focus groups and interviews, and then evaluating these accounts in peer analysis and in the assessment write-up, permitted students to not only share their spatial interpretations of the city, but to hear and to learn from alternative accounts and experiences. Many students reported that this encouraged them to think more critically about their own impacts on the city – both positive and negative. Yet in a deeper sense, it became apparent that such efforts can challenge stereotypes and assumptions of what it means to be a student in the contemporary city, and ultimately to develop a more nuanced understanding of aspects of social sustainability. As is to be expected in an educational assessment, the extent to which this was executed varied across the cohort, but many students did develop a robust critique of studentification, reviewed its representation in academic literature and media, and explored how studentification is practised and performed by fellow students. This extended to critiques of the generation of their qualitative data (in terms of the partiality and composition of interviews and focus groups), and a contrast of their data with their own student experiences. Demonstrating this, several students wrote about how the work helped them appreciate the ‘fluidity’ of student identity, particularly how those they spoke to from different backgrounds experienced student-hood in varying ways and have contrasting experiences of city spaces and places. We would argue therefore, that this sort of exercise has a number of key and critical benefits. Firstly, it allowed students and staff alike to explore a wider understanding and conceptualisation of what sustainability means. The emphasis upon social dimensions of sustainability encouraged students to become attuned to that particular strand of the concept. Secondly, it allowed students to demonstrate their understanding of both human geographical theories and those surrounding issues of sustainability in a context that is relevant to their (newly acquired) life. Finally, it allowed students, and indeed staff, to consciously explore the impact students had on the urban fabric in terms including, but not limited to, cohesive neighbourhoods, identity, exclusion, segregation, liveability and quality of life. This reflective learning in the Living Lab of the city and the classroom can, we hope, have a real impact on those experiencing – and who ultimately are responsible for – studentification in the contemporary city. Julian Holloway is a Senior Lecturer in Human Geography at Manchester Metropolitan University. His research is primarily concerned with religion, spirituality and space. He is also interested in sonic geographies and hence the relationship between sound, space and place. Paul O’Hare is a Fellow of the Institute of Place Management and a Senior Lecturer in Geography and Development at Manchester Metropolitan University. His research focuses on resilience and participatory planning. 1. Smith, D. P., Sage, J. and Balsdon, S. (2014) The geographies of studentification: ‘Here, there and everywhere’. Geography, 99(3), pp.116–127. 2. Universities UK (2017) Higher Education in Numbers. Universities UK. <www.universitiesuk.ac.uk/facts-and-stats/Pages/higher-education-data.aspx > [Accessed: 16/6/2017). 3. Smith, D. P. (2002) Patterns and processes of studentification in Leeds. Regional Review, 12(1), pp.14–16. 4. Munro, M. and Livingston, M. (2012) Student impacts on urban neighbourhoods: Policy approaches, discourses and dilemmas. Urban Studies, 49(8), pp.1679–1694. 5. Hubbard, P. (2008) Regulating the social impacts of studentification: A Loughborough case study. Environment and Planning A, 40(2), pp.323–341. 6. Visit Manchester (2017) Universities in Manchester. Invest in Manchester. <www.investinmanchester.com/why-manchester/education/universities > [Accessed: 13/06/2017]. 7. Abbit, B. (2015) Crackdown on noisy students isn’t working say fed-up Fallowfield residents. Manchester Evening News. <www.manchestereveningnews.co.uk/news/greater-manchester-news/noisy-students-complaints-fallowfield-university-10156094 > [Accessed: 17/10/2017]. 8. Abbit, B. (2016) University security staff have visited 64 student homes after noise complaints. Manchester Evening News. <www.manchestereveningnews.co.uk/news/greater-manchester-news/student-homes-visited-noise-fallowfield--11989702 > [Accessed:30/6/2017].